Are you ready to jump in your swimming pool? As winter fades and spring turns to summer in Delaware, we’ll be ready for a nice cool dip. Enjoying the pool anytime day or night is fun when you have pool lighting installed. Even more enjoyable is the beautiful ambiance you can create with lights in and around your pool. Think of all the great pool parties you can plan for after dark. Whether it’s a few friends or a full-blown pool party, there are some great ideas in pool lighting that will make everything even better. Pool lighting in New Castle County also bumps up the aesthetic appeal of your property. In fact, many homeowners install pool lighting just for the aesthetics. You’re going to love all the great outdoor lights and swimming pool lights available today. You may already have one light which was installed with your pool. That’s fine, but it does little to create ambiance or party fun. The world is forever changing, and many changes in the technology industry are very good at making our lives easier and better. Pool lighting is on it’s way to becoming fun, beautiful, and easy to control. Today’s options in pool lighting allow you to choose from an array of new LED lights that can change color automatically or at the push of a button on a handheld remote. LED lighting is very efficient and can be integrated into a number of outdoor fixtures. You may want to arrange a series of pole lanterns that surround the pool. If you have a deck or stairs, recessed lights can be installed for easy and safe pool access. LED party lanterns and string lights are fun and come in a variety of themes and styles. The last thing you’ll ever hear from any electrician is that it’s okay to install your pool lighting yourself. You don’t want a serious accident to occur on your property whether it’s a loved one involved, yourself, or later a guest. 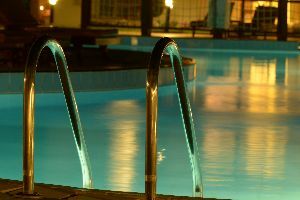 Pool lighting can be dangerous if installed wrong or the person doing the work doesn’t know what they’re doing when working with electricity. Water and electricity do not mix. You don’t want this deadly combination touching together anywhere. If you’ve ever seen electricity jump from one place to another, then you know what electrical arcs are. This is why it’s so easy to get electrocuted when working on wiring yourself or when you’re around a loose connection or where insulation is worn off the wiring. If you’d like to learn more about pool lighting options, give our New Castle County electricians a call at Electrical Solutions. We have over 20 years of experience and will make sure the installation is handled properly and safely. If you have questions or want to inquire about Pool Lighting in New Castle County, please call 302-994-6252 or complete our online request form.